Random Panel: What the … But that's … oh my. 13 Responses to Random Panel: What the … But that's … oh my. I get that he’s being held prisoner by some gigantic goon, ok. And I understand that sometimes your choice of camera angle makes for some … unfortunate optical illusions. But this went on for like eight pages. In four different panels. All the same. Plus the whole idea of it — what, they don’t have handcuffs?! And who holds a prisoner that long bent over that far? And the way he’s holding the guy, he’s got no leverage. Then again, the prisoner apparently has mutant non-human muscles on his back, so who knows what he’s capable of? I’d love to see if the submi(ahem) prisoner is like, straddling a table or something. 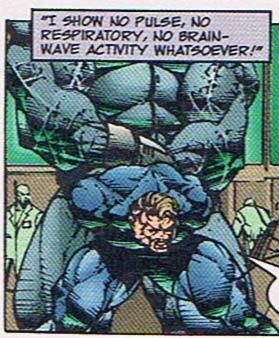 Because otherwise, that gigantic mutant bug cop is totally lifting the dude up and having his way with him. On the other hand, if he shows none of those signs, how come he’s talking? You’d think that people get the idea that he’s not dead if he keeps talking, right? Neil Leslie wins the thread! This is what Rob Leifeld does to art. He rapes it. Violently. Since he’s not showing any pulse, respiratory and brainwave activity, I think the big guy is just taking the other guy’s temperature. Where the frack are the bottom’s arms? There is no way they could bend and be held like that. It’s sort of an extension of equipment that’s drawn in later and not really ‘held’ by the character. I look back and wonder if I actually *liked* this stuff back then. I need to dig out some of my old comics and see what I think about them now. Now that I’m sober, I think they are referring to the artist in here.